I used to wince at the thought of spending more than £10 on cleanser but this stuff has really changed my mind! It has a light gel consistency that turns milky when mixed with water. I like to use this as a second cleanse because it's light and refreshing on the skin. It has a light Cucumber scent which I actually really like. It leaves my skin feeling so clean and fresh. Even since I started using this I've noticed a huge difference in my skin. I get less breakouts and the texture has improved overall. I think this would be good for all skin types. I can't recommend this enough! Another cleanser that is worth the price tag is this, well I would actually say this is more mid price, especially as you're getting two cleansers in one. I'm sure most of you would have heard of this by now. But the skincare genius Caroline Hirons has teamed up with Pixi to bring us a two step cleanser in one. The first cleanser is a solid oil that melts into the skin lifting every scrap of makeup. And second cleanse is a cream cleanser to clean the skin. The cream cleanser is really nice and cooling on the skin. It's fragrance free and free from any nasties. It is just a great, no fuss cleanser that gets the job done! This is a cult classic and sure many of you already use this and if you don't you probably should! It's an AHA based toner that gently exfoliates the skin, lifting away dead skin cells that block pores and prevent the skin from looking healthy. It also contains lots of other skin loving ingrediants to help plump and hydrate the skin. It's gentle enough it can be used twice a day. But I only use it once in the mornings. The difference this has made to my skin is brilliant, my fine lines look better, my skin just looks more healthy and glowing. It's called glow tonic for a reason! Oils I have certainly found are much better from the high-end price bracket. One of which is the Kielhs Mid Night Recovery oil. This stuff is great! It's formulated with almost all natural ingrediants to plump, nourish and hydrate the skin, all while you sleep! And it really does. Every time I use this I'm instantly wowed at how much softer my face feels. It also adds radiance. It's good solid all round oil. This has been on my wishlist for the longest time so I was so happy when it landed on my door step. This oil is aimed at those with dry / combination skin. It uses a unique blend of plant extracts and essential oils to deeply nourish the skin. The oil itself is light and absorbs quickly. I'm not a massive fan of the smell, it kind of reminds me of old ladies. But that aside I love this stuff. I've been using this with the Fresh cleanser and my skin literally improved in matter of days. I'm not exaggerating. All my texture issues have gone and I think it's because of this and the cleanser. It also leaves my skin so soft and plump looking. It's become a staple in my routine that I can't be without! I'm nearly out of this stuff which makes me so sad. This is an award winning oil that combines the benefits of Rosehip oil and Seed oil to nourish the skin. Rosehip is an oil that is known for its ability to help reduce scarring. I don't overly have scarring but I have little red dots left over from blemishes that will not go. And I think this is really helping. It also speeds up the time it takes for blemishes to go. Not only does it do this but it's also super hydrating and keeps my skin soft. I do find this oils a little thicker than most but I really like this, it's definitely worth looking into. This is an overnight mask that is like a thick moisturiser. It has a sticky consistency but it absorbs into the skin quickly and easily. It's packed with skin loving ingredients to plump, nourish, help the skin renew itself and hydrate the skin over night. This does everything it claims, my skin is much softer and smoother when I use this. It also leaves my skin with a glow. It has a really nice scent to. Another great product! I think this mask is definitely worth the investment! It's using AHA to gently exfoliate the skin in a thick, jam like mask. The benefits of AHA include smoother skin, fine lines look reduced, skin has more of a glow and it helps improve texture. This really does all of the above. I like to leave it on for 15 minutes then remove. My skin instantly looks better! It has a definite glow about it and feels so much smoother! This is a fantastic mask, that I think would be suitable for most skin types. Although I'd use with caution if you have very sensitive skin. This is another AHA mask that works in the same way as the REN one. Although this one is slightly different in texture. It has gritty particles in it that also help exfoliate the skin. I also found this a little harsher than the REN too, it tingled on my skin but this isn't uncommon for AHA. But I can't leave this on for as long. I manage around 5 minutes before the tingling is too much. The results of this are incredible. Those little Red dots I talked about earlier instantly looked better! My skin has glow and is so much smoother! I'm yet to find a cheaper mask that has the same effect! Another one of my more pricy masks which I love is this. I reach for this when I don't have a particular skin concern I want to address because it's so hydrating and a great all rounder. It contains Manuka Honey which is a great, natural antiseptic, while being super hydrating. After using this my skin is incredibly soft and looks brighter. I think this would be great for all skin types even those with sensitive skin. 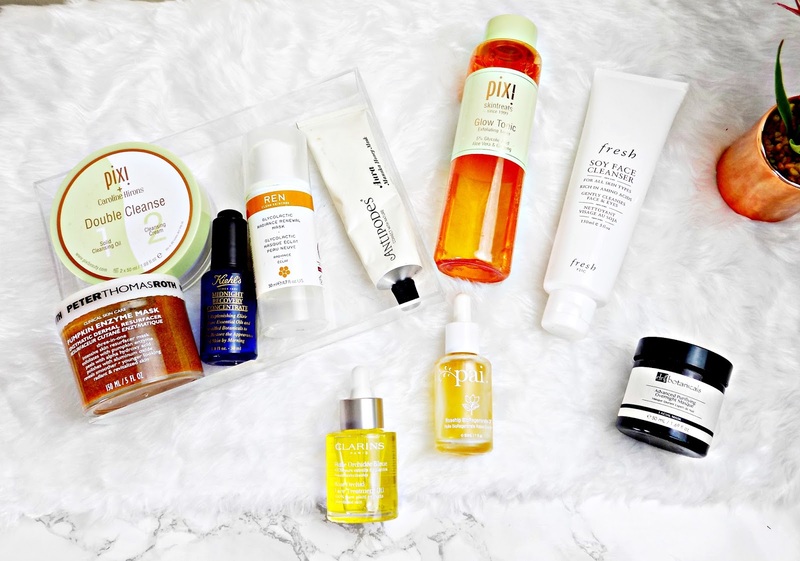 All these products here have given me amazing results but remember skincare is so subjective and because they work for me doesn't mean they will work for you. But I hope this gave you some direction as to what high-end skin care is worth the investment.